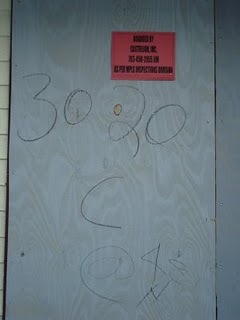 Ed Kohler at the Deets had an excellent post about combating sign spam. In that post, various exchanges between the Hardest Working Lazy Guy blog and a sign spammer were documented, and elevated almost to an art form. 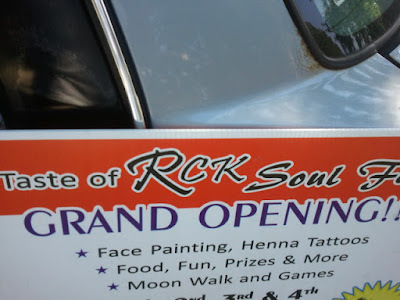 So when I came across the RCK Soul Food sign spam that was littered across NoMi this week, I looked to see if they had any online media that would allow for a similar exchange. I posted a comment about having removed their litter ("Your illegally placed sign spam at the corner of Broadway and 94 has been removed. Please take down any other items. "), and since my Facebook and Youtube accounts are linked, several friends saw the comment and removed even more sign spam. The author of the video responded to my statement by saying.. Proposed changes to home mortgage guidelines could have far-reaching and unintended effects on the housing market in north Minneapolis and communities across the country. Qualified Residential Mortgages, which have not gone into effect yet, would require lenders to adhere to certain standards when securitizing mortgages for the secondary market. There are a bevy of such possible new rules, but the most controversial of them would require homeowners to come up with 20% down in order to qualify for market interest rates. David Stephens, president of the Mortgage Bankers' Association, said the rules "could lead to 'long-term rental entrapment' for 'large numbers' of Americans who would need at least a decade to save for a 20 percent down payment." According to the Heritage Foundation, only 16 percent of homebuyers in 2010 would have qualified for a mortgage if they had to come up with a 20% down payment. Contrast that with the American Dream Survey by Trulia, where 47% of renters who plan on buying a home in the next two years say that CURRENT down payment issues are the primary barrier keeping them from buying sooner. Locally, Alex Stenback of Behind the Mortgage writes that we can have a relatively accessible housing market with easier access to loans based on credit, down payment, and other factors; or we can have a relatively risk-free housing market with higher credit, down payment, and interest rate standards. We can't have both. Anyone glancing at my Twitter feed can tell I'm on vacation this week. 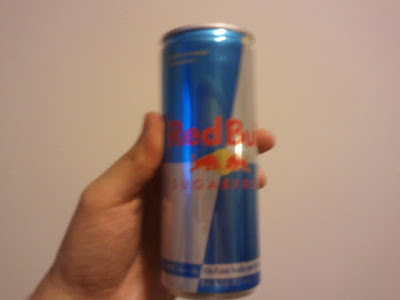 And I'm largely taking a break from blogging while I'm away. I sent The Deets an account of hotel toilet paper, but that's been the extent of it. But before I left town, I distributed some trees from the EcoVillage Tree Nursery, and moseyed on over to the community garden by the Bangkok Market. Our partners at EJAM (Environmental Justice Advocates of Minnesota) were kind enough to reserve a plot for me, and thoughtful enough to populate it with hot peppers. 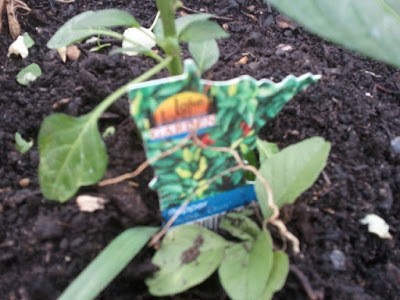 They're not the hottest peppers one can find in a seed catalog, but they'll give me a start in learning how to tend these plants. 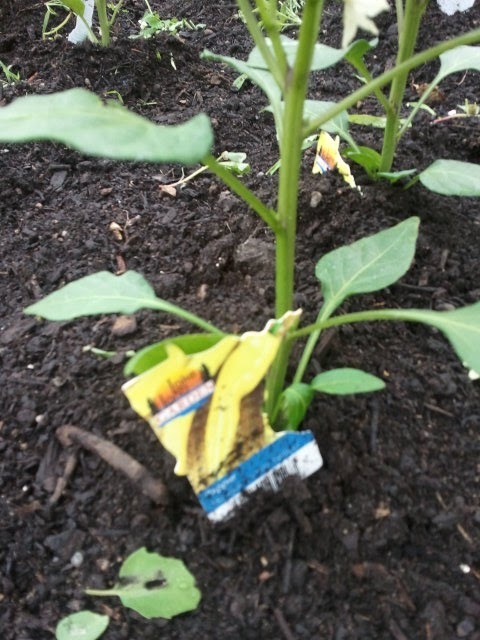 The peppers also serve as a reminder that even when one takes time to rest, the seeds we plant in our community continue to grow. Look at all the people who aren't in the alley...because they got arrested. Over the past two weeks or so, neighbors on the 2600 block of 3rd and 4th Street had noticed quite a bit of traffic coming and going from the alley by the castle townhomes. 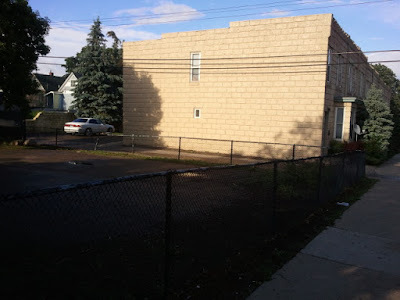 The activity had all the hallmarks of something nefarious: someone who was pretty clearly a lookout/sentry, high volumes of cars that never stay for more than a few minutes, and quick exchanges with the long white tee crowd hanging out on either side of the alley. But what raised my suspicions was something else entirely. I often walk past here when I go hula hooping at Farview Park. And on my way there and back many of the neighborhood kids who play in the parking lot will ask to try out my hoop. I give each of them a turn, and show the kids how to do some of the basic hooping moves. After a few minutes of this, the sentry would come over and tell me to move along and not play with the children. Now what's the one reason why someone wouldn't want me hula hooping with their kids? Post by the Hawthorne Hawkman, photo from the University of Minnesota. Today I was deeply saddened to receive a phone call from a colleague at CURA, telling me that Kris Nelson passed away in his sleep last night. Kris had touched community organizations and people's lives in countless ways. I began working with him during my first summer on the job at Hawthorne, as we studied the pattern of "predatory investors" or speculators and slumlords who bought cheap properties throughout north Minneapolis and caused a large percentage of our foreclosures. Kris taught me how to examine data that affected our community in real ways. I learned how to frame questions and how to avoid jumping to the wrong conclusions. We later worked together on studying how effective NCRC was in our foreclosure prevention outreach work in north. The strategies that coalition employs are a direct result of Kris sharing his knowledge and leadership. 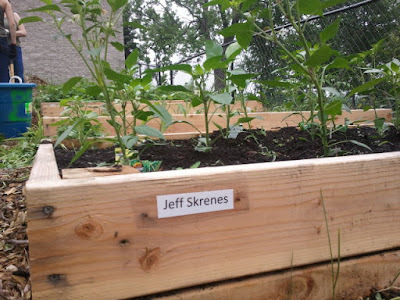 Kris also understood that there are many things that neighbors intuitively know about our own community, but when the University of Minnesota puts is official stamp on research about those things, we can use that credibility to bring about true change. Kris Nelson was "the real deal;" a leader, a servant, a mentor to many, and a genuine friend to communities across the Twin Cities. He will be missed. Council member Diane Hofstede informed residents at the 3rd Ward CARE meeting that the Northside Food Market owners had not yet submitted architectural plans for how they will comply with the orders to rehab their property. 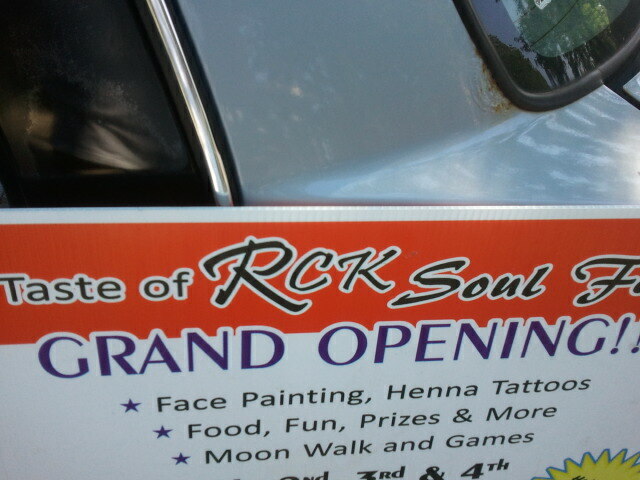 Instead, their plan appears to be an attempt to sue the city so that they can remain open for "business." Business in this case means renting out the 466-square foot apartment to whoever will bring in a constant parade of drug deals, and then blame the drug dealing on the bus stop in front of the establishment. A new round of community impact statements will certainly help keep Northside Food Market shut down until (if ever) the owners come up with a viable plan to address the problems associated with how the place has been run. The city council will be taking up 2222 4th St N at 1:30 on Monday. Once again, impact statements should be sent to Diane Hofstede, or people can call her office at 612-673-2203. Post by the Hawthorne Hawkman, photo by Scottie Tuska. One of my favorite artists is an illustrator by the name of David Mack. Mack is most famous for his Kabuki graphic novel series, but also published long exposure photos where he made drawings using light. Since then, I've been fascinated by the artistic combination of light, motion, and photography, and took my own similar shots at the Chicago Fire Arts Center opening. 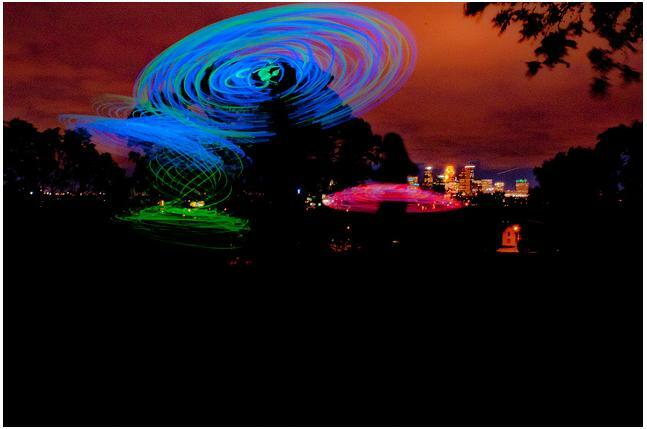 Several hula hoopers got together last week and Scottie photographed us with the city skyline in the background. This was the first attempt at such pictures, and there will likely be more. The series can be found at his flickr account, and Scottie also has his own blog. Post, photo, and video by the Hawthorne Hawkman. 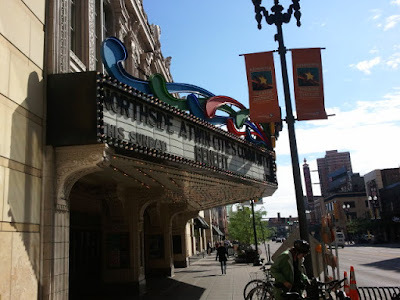 If you weren't at the State Theater on Sunday night, you missed one of the best concerts Minneapolis has seen in a very long time. The fact that the show didn't sell out immediately was rather disappointing. North Minneapolis has already felt the arms of over 5,000 volunteers wrapped around our community in support, but a show of this caliber deserved more people watching. Thankfully, I took plenty of video footage. 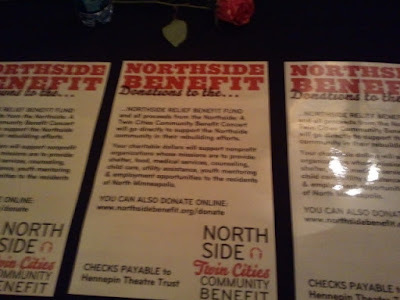 Before we get to more music, here's a fun fact: The Northside Benefit Concert took place on Sunday June 12th, and NOT, as I had mistakenly put in my calendar, Saturday June 11th. This mistake was compounded when I immediately bought two tickets the instant they went on sale, and invited a friend along for the show, which I found out later, was on SUNDAY. In spite of the clear instructions on my ticket, I just assumed that if we were going to get this many amazing local artists in one place on a weekend, then an event of such magnitude would have to be on a Saturday. Not wanting to be late, my companion and I unknowingly arrived a full twenty-four hours ahead of time. Since this would be the social event of the summer, I put on a suit and she wore a sleek outfit with shoes that looked so great they had to be tremendously uncomfortable. We excitedly posed for pictures outside the State Theater, and went inside to find...nothing. It was a veritable ghost town. "Oh no!" 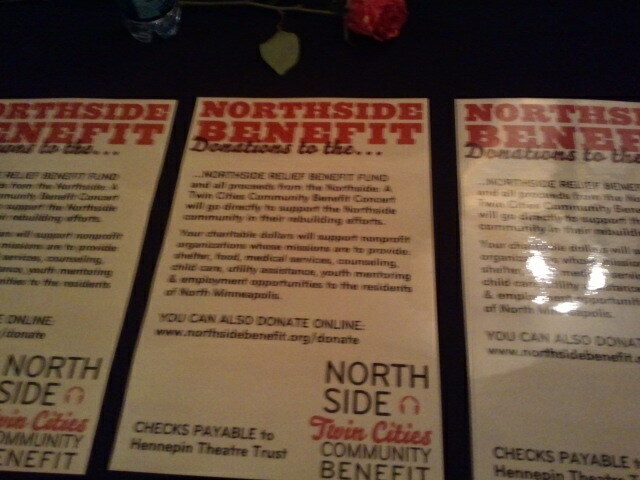 we thought, "Nobody cares about north Minneapolis!" Upon a closer examination, however, we determined the correct date for the concert. As it happens, my Android phone is synced with Google, but apparently Google did not notify the dozen or more performers, their stagehands, and other appropriate staff that everybody needed to arrive a day early. I'm telling you this, dear readers, because my friend is so pleased with the opportunity to talk about how shameful this all was for me that you've probably already heard about it. And because the concert was so amazing that it easily offset the temporary (or if she has her way, permanent) embarrassment I have suffered. Watch that hyperlink to the CBS story, if you have time. The videos above and below have McLaughlin playing straight chords and strumming, not the intricate finger-picking that he displays in the news story. His comeback is nothing short of amazing, and we can only hope that north Minneapolis can mirror it. While videos are uploading from the phenomenal Northside Benefit Concert this evening, a preliminary post about my first Nice Ride experience is due. 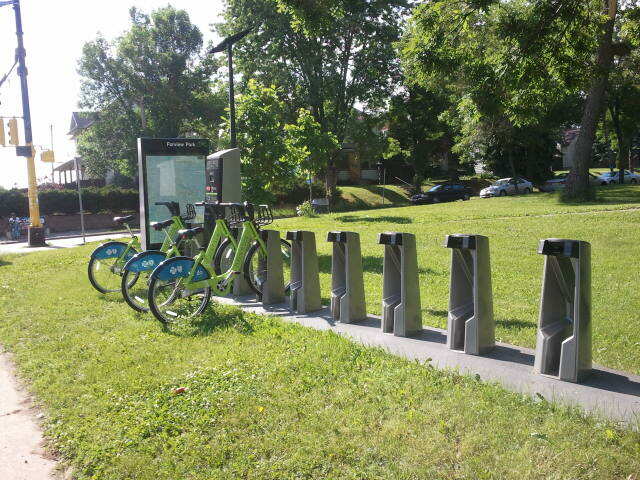 I started at the kiosk at Farview Park, and found the bikes a bit clunky. Getting them in and out of the kiosk is tricky at first, but not too hard to master. Nice Ride bicycles are heavier than the average street bike, and that slowed me down a bit. They also have only three speeds, and it wasn't until I was limited to such a low number that I realized how I am almost constantly shifting gears on my 21-speeder. That being said, the convenience of not needing to bring along a lock or other supplies, and not worrying about what to do if I met some friends after the concert and headed elsewhere allowed me to bike to a show that I otherwise would have driven to (and paid for parking). In keeping with my biking themes, it's a nice coincidence that I made it to the kiosk at 4th and Hennepin in - you guessed it - fifteen minutes. Since I already have a bike, my primary use of Nice Ride bicycles will be in situations like this. 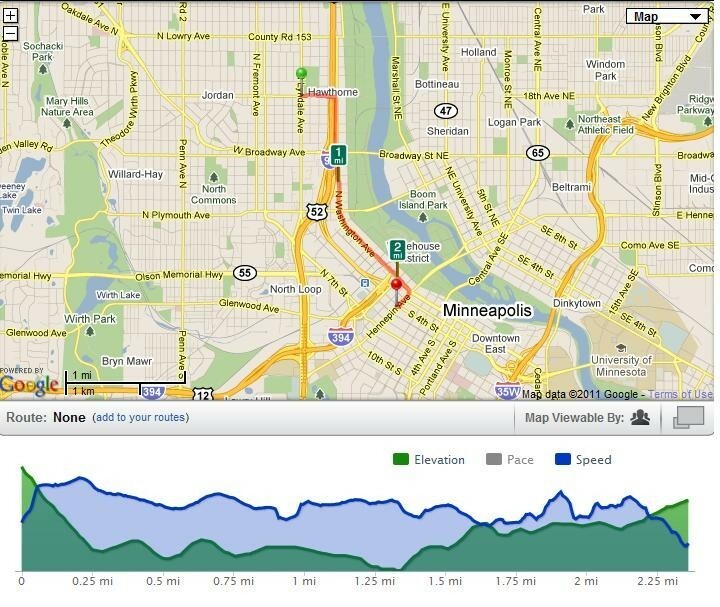 They're perfect for heading from NoMi to downtown quickly, and best of all, parking is free. What Does Post-Tornado Crime Data Tell Us? 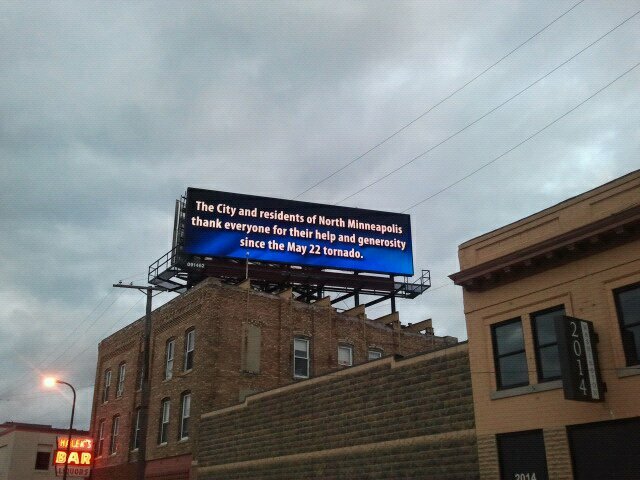 Post by the Hawthorne Hawkman, photo from KSTP. Shortly after the tornado hit, I was quick to criticize several media entities for over-reporting isolated incidents of criminal activity. I also promised to look into actual statistics to see if perhaps I was the one jumping to conclusions. The city of Minneapolis and the 4th Precinct have made some data available - enough to do a preliminary examination of crime trends to see what things are like in NoMi. First off, Ed Kohler at The Deets wrote an excellent piece about how we shouldn't read too much into shot spotter map disparities. Keep in mind that shot spotters are installed only in certain areas of the city, making the reporting higher in those areas than elsewhere. Shots fired aren't over-reported in parts of north and south Minneaoplis, they're just under-reported in other areas. Second, I'm compiling numbers based on visual recounts of maps from the city's shots fired page. 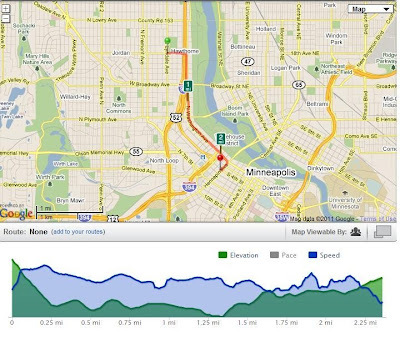 One criticism of those maps is that they don't actually show hard numbers, only dots. When multiple shots are reported in a small area over a one-week period, it's hard to be 100% certain how many dots one is counting. So if my numbers are slightly off when compared with other data, that's why. On Saturday I joined a legion of 2,000 volunteers as people from all around the Twin Cities continued to clean up NoMi after the tornado. 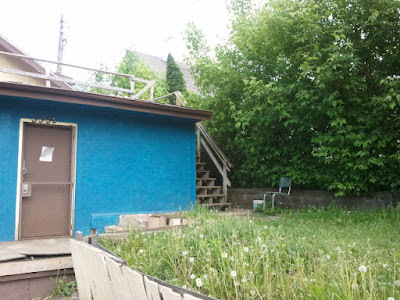 My group spent the bulk of our time around 29th Avenue and Morgan Avenue North, cleaning up the yard of an immigrant couple. Most of the heavier branches had already been cleared up, but plenty of other debris remained. When they found out we were cleaning for free and not some kind of scam, we were quickly invited into their yard and got to work. Post by the Hawthorne Hawkman, photo by NoMi Passenger, originally appeared on the Johnny Northside blog. When NoMi neighbors first notified me that Mahmood Khan was on the cover of the Star Tribune, my initial reaction was one of shock and disbelief. I wanted to fire off another heated post about irresponsible journalism. That is, until I read the article and saw Khan readily admit his shortcomings. The city "expects Edina, but this is not possible in this part of the world," said Khan, a Roseville resident. Thank you Mahmood for showing your true colors to anyone who wasn't already aware. North Minneapolis is apparently another part of the world than Edina, where quality housing simply isn't possible in Khan's vision. For the record, the Strib article spells Khan's first name as Mahmoud. Given that city records show Khan owning a rental property at 2906 Emerson Ave N (where neighbors have reported suspicious drug dealing activity) and his name is spelled "Mahmood," that is the spelling I will continue to use here. I want Khan's low standards to be exposed, even indirectly, in a cover story by the Strib. And I'm glad to see Stephen Meldahl included in the article too. Whenever the spotlight is on our problem landlords, that has to be considered a good thing. They'll either be exposed for what they are, or they will improve their performance knowing that the community and the press are watching. Post by the Hawthorne Hawkman, photo by Joel Breeggemann. This billboard has been popping up all over town, and says it all. Thanks everyone, for your generosity. Northside Food Market Closed for "Construction"
The recent tornado wasn't the only big gust of wind that came through NoMi in the month of May. A short time earlier one could hear a collective sigh of relief from McKinley that the Northside Food Market, which has been a problem for years, is FINALLY closed. 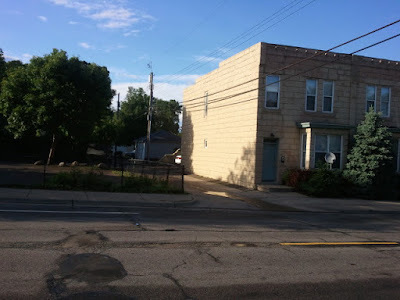 The Northside Food Market is run by Supton LLC, and the contact people for the rental license at this address are Ahmed J Alnosawi and Hussain Zahid, 612-522-5962. 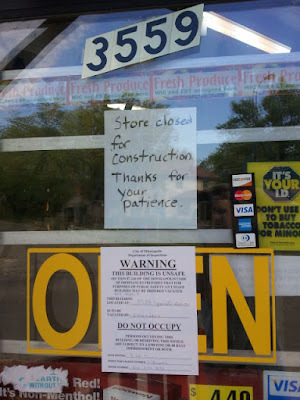 If you believe the handwritten sign, they're just closed for construction. 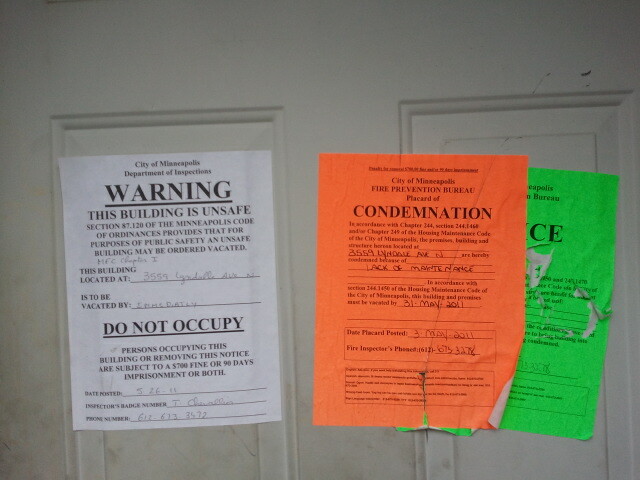 Oh, the closure has nothing to do with the condemnation notice from the city of Minneapolis. On related notes, John Edwards stepped aside from politics to spend more time with his family, and Manny Ramirez retired from baseball due to "health reasons." Local residents now use the famous word "quiet" to describe their street corner at 36th and Lyndale. We hear this so often in NoMi. A place is problematic for months or sometimes years and it just drives the neighborhood nuts. Then when it finally gets shut down, people stop and listen to the sounds of silence. I love hearing folks using "quiet" as a catch-all for "Thank GOD those drug-dealing thugs are off my block!" Shutting down inconvenience stores is no small feat and we're definitely grateful for the work our elected officials and city employees put into accomplishing this task. But in talking to some of the people most directly affected, the common sentiment is that this process took far too long.